The Falcon 9 rocket blasts off with the doomed Zuma satellite on board, January 7, 2018. The loss of a multi-billion-dollar satellite this past January is being attributed to engineering and testing errors made by aerospace and defense firm Northrop Grumman Corporation, according to a recently concluded investigation. 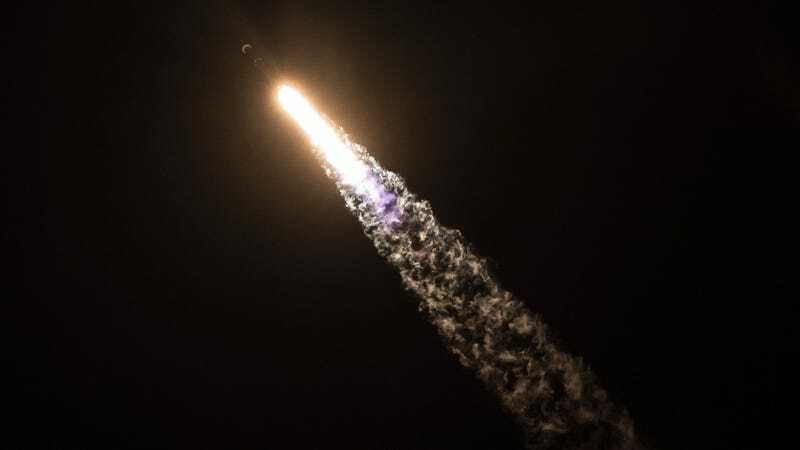 As the Wall Street Journal reports, a payload adapter modified by Northrop Grumman failed to operate properly during deployment, causing the $3.5 billion satellite to stay attached to the second stage Falcon 9 rocket during its descent stage. After a brief period in space, the spy satellite re-entered Earth’s atmosphere, likely splashing down somewhere in the Indian Ocean. Such is the preliminary finding from two separate and independent teams of federal and industry investigators, according to the WSJ. No publicly available report detailing the cause of the malfunction has been released, nor is it known if a report is even forthcoming. Sensors on board failed to immediately report what happened... so officials tracking the launch weren’t aware of the major malfunction until the satellite was dragged back into the atmosphere by the returning second stage. The satellite ultimately broke free but by then had dropped to an altitude that was too low for a rescue. Northrop Grumman built the satellite, which was so highly classified that its purpose still hasn’t been disclosed. Likewise, no particular agency has been publicly identified as the customer. Industry officials and military-space analysts have said it likely was an advanced type of space radar or missile-warning satellite. Investigators have focused on the satellite’s unique design, which was particularly vulnerable to shock and vibration, according to people familiar with its characteristics. That prompted Northrop Grumman to specially modify the adapter to cushion separation of the satellite in orbit, according to one of these people. Adapters typically use explosive bolts or other powerful systems to break satellites free of their attachments to rockets. It’s been a rough year for Northrop Grumman. This news comes just two weeks after NASA blamed Northrop Grumman for “avoidable errors” leading to further delays with the James Webb Space Telescope. NASA officials are now asking for bimonthly updates from the senior Northrop Grumman managers, along with requests for personnel changes. Yikes, conversations are probably a bit tense around the old Northrop Grumman water cooler these days.